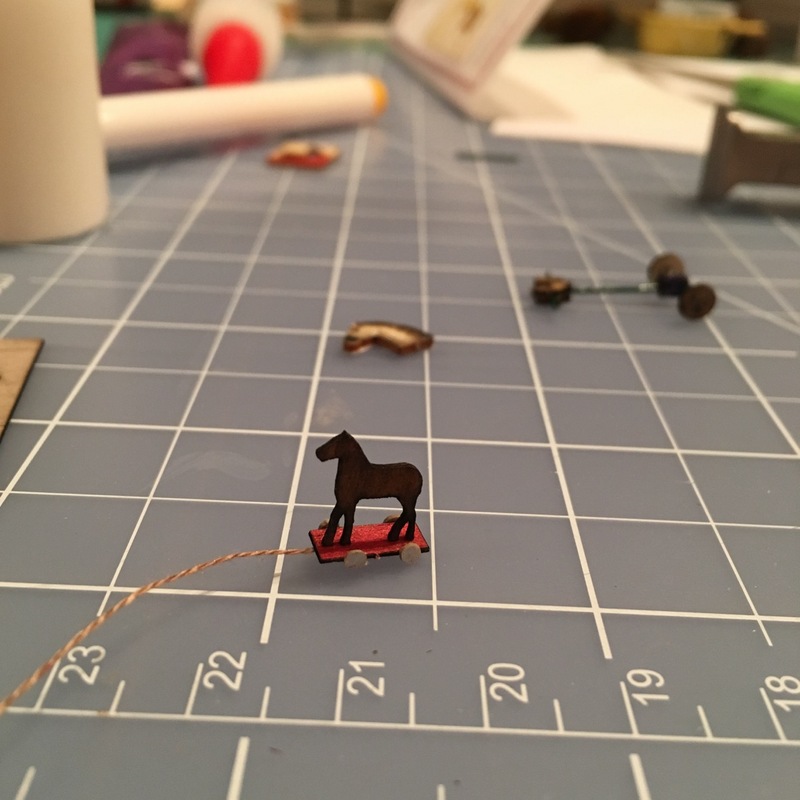 With the Cranberry Cove finished, I have been working on small things for the Storybook toy store. I bounce back and forth between making the little things and working on the house. 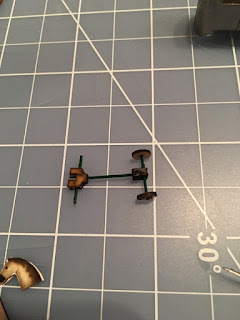 Right now I am trying to get the templates for the wallpaper accurate. The front wall is giving me the most trouble. 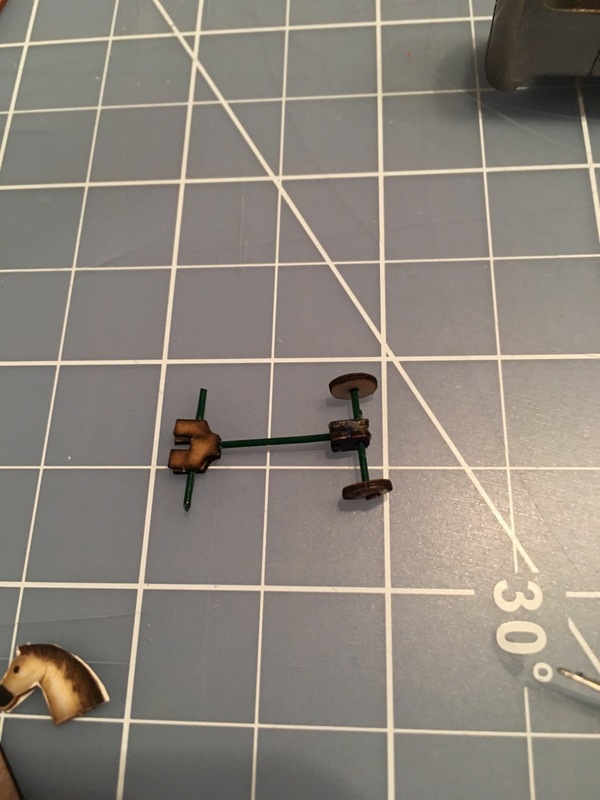 Here's my progress so far. 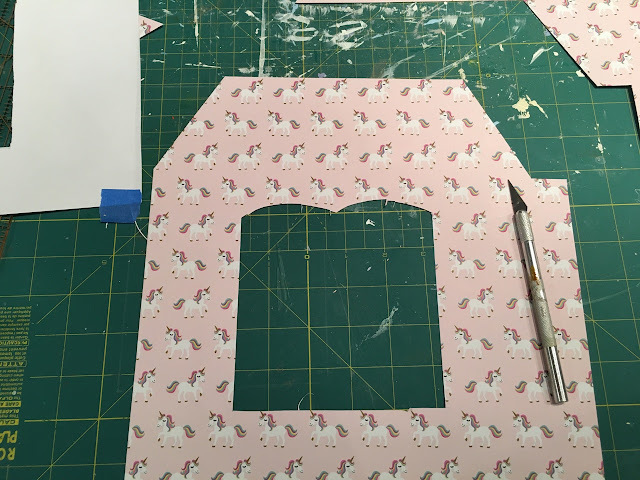 Using the computer paper template, I cut out a mock template on the unicorn craft paper. Looks good. 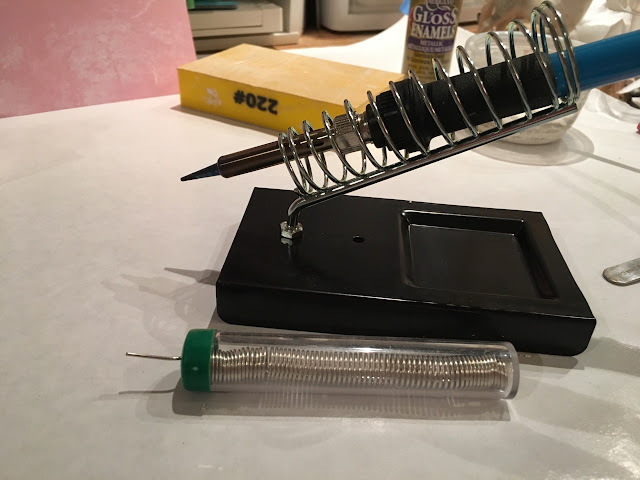 I had to replace the place in the Xacto knife to get a good cut. Nearly perfect. I am not so worried about the top edge of this side wall because I will be adding a scolloped trim, but I did cut a bit wide at the bottom of the window. The curves at the top of the window are a more important accurate cut. While those curves are a perfect fit, the store front wall is a tough wall because of the window trim and the narrow spaces. 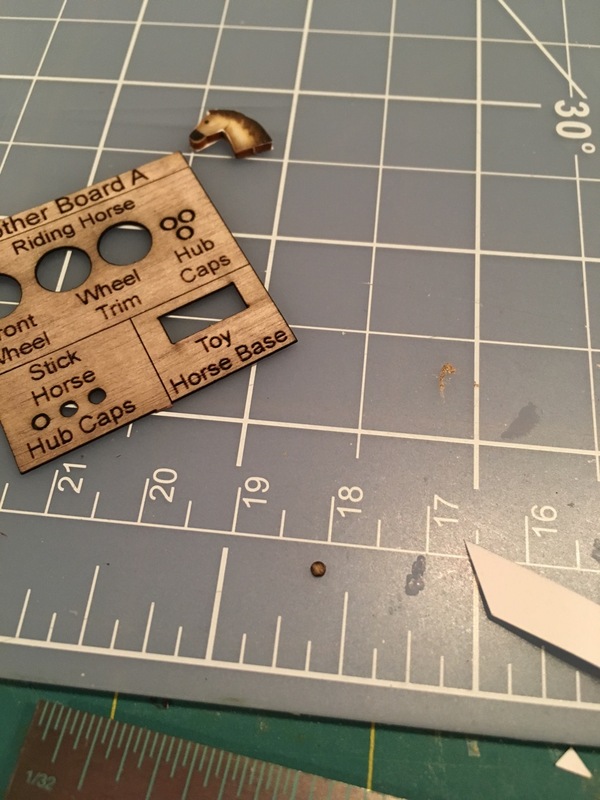 I struggled to get the template plate accurate, which I did with the computer paper, but I am still struggling to get a good fit with unicorn paper. 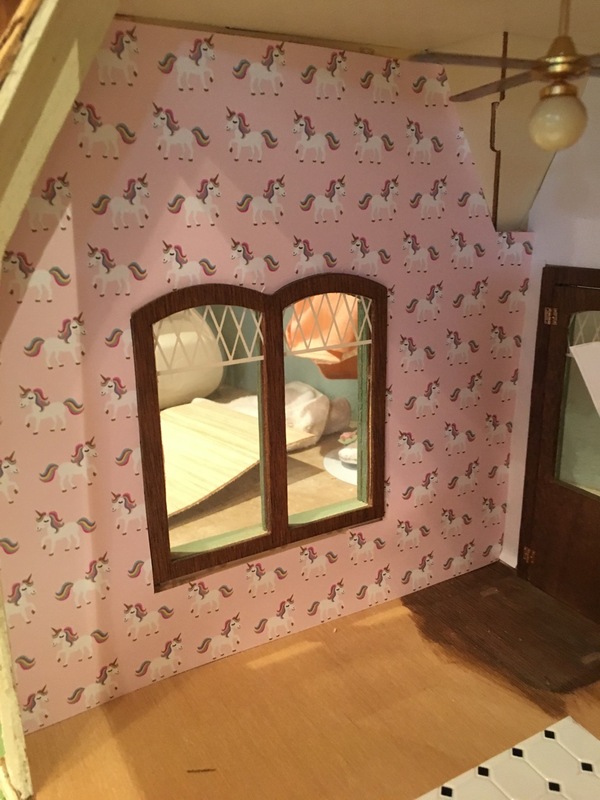 As I explained in a previous post, I bought the unicorn paper to use as wall paper, but decided even before I cut it that it was too bold, so I purchased good quality wallpaper from Itsybitsy.com (by the way, they are now selling flower kits.) The unicorns are growing on me, however. Still, too bold. 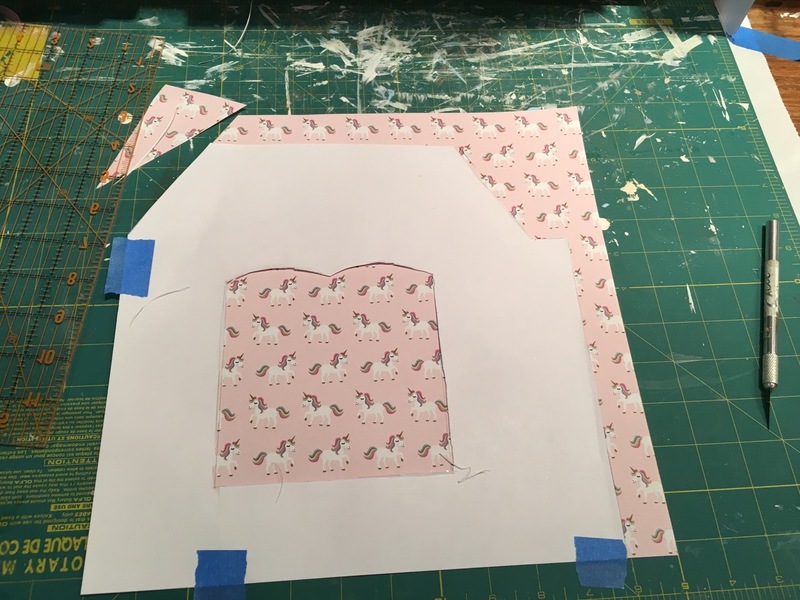 So, only when I get a really good pattern cut will I cut into the wallpaper. And I have been shopping. I found these classic Fisher Price toys on Sarahsookakbabies on Etsy. 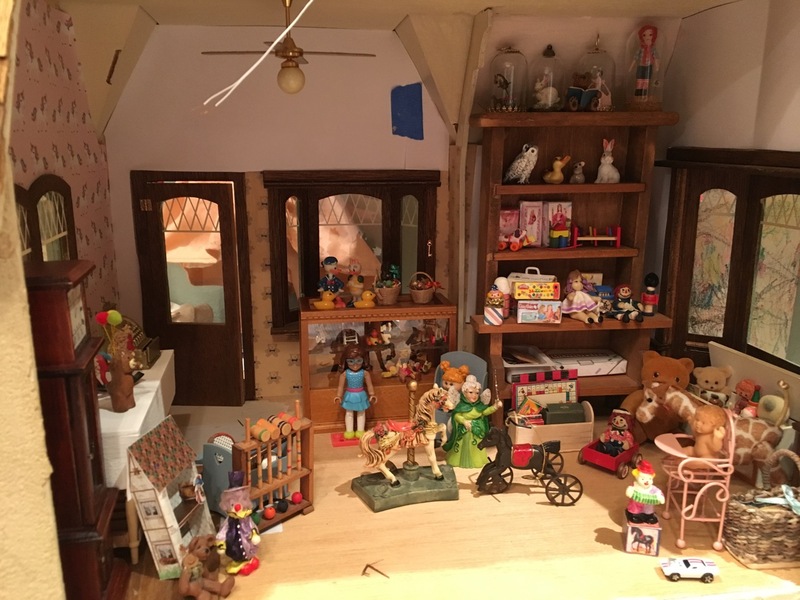 The original toys that came with the house were bears. A lot of bears along with a few clowns, but mostly bears, so I am expanding the inventory. 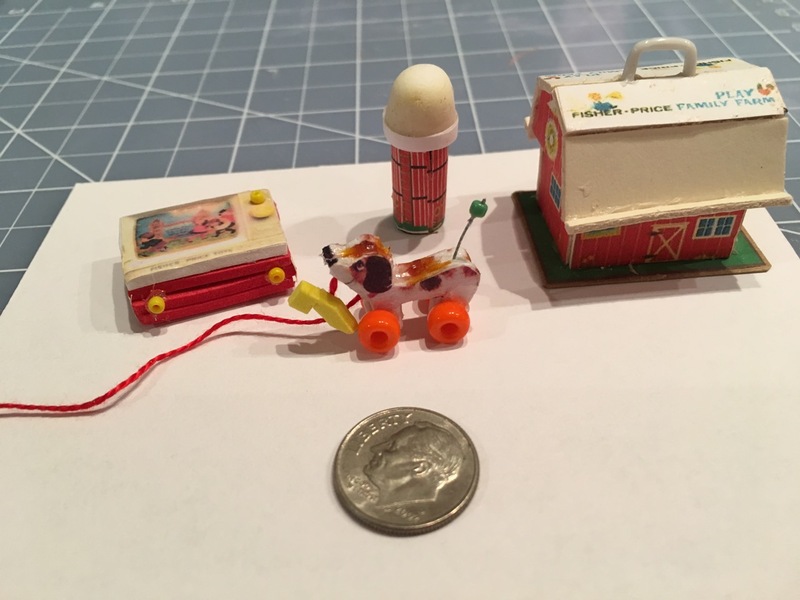 My girls spent hours playing with their Fisher Price toys, so when I found these on etsy.com, I had to have them. 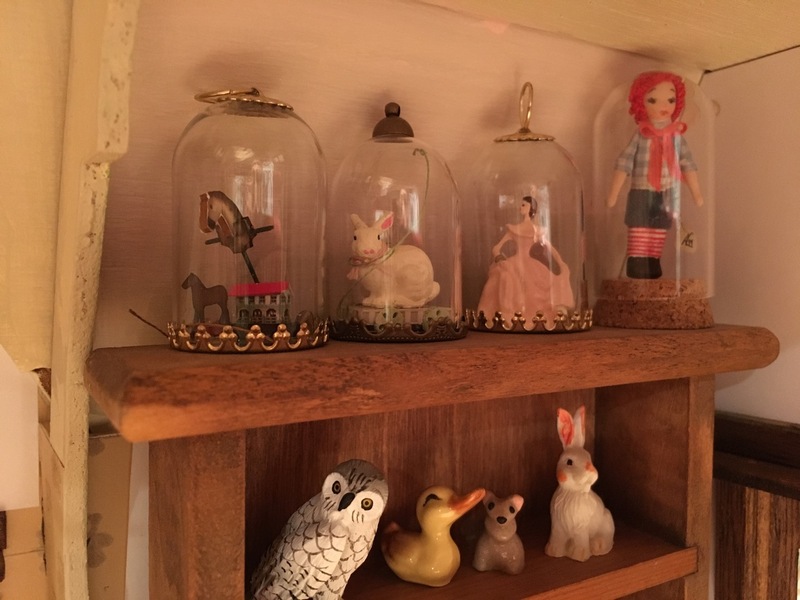 They are all handmade by Sarah in England with authentic accuracy, and while, you as you can see, the items are hand made making them even more special. 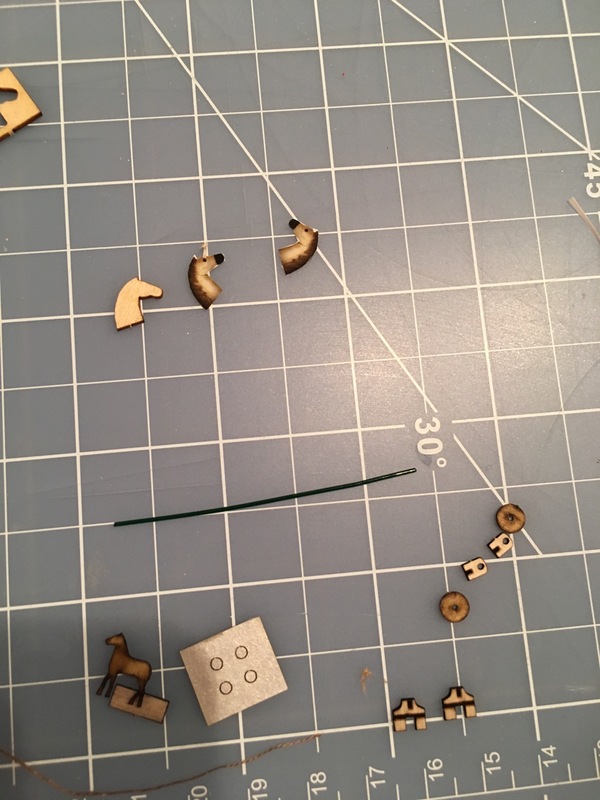 I, too, am working on some handmade toys for the store. 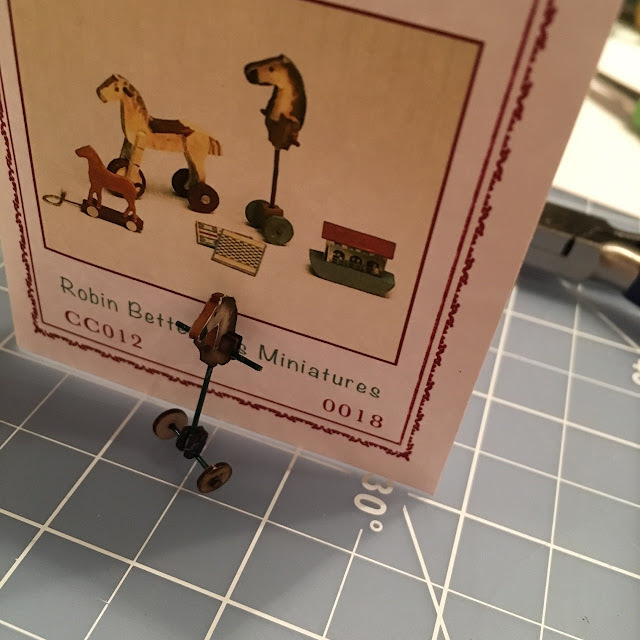 I ordered this kit from Robin Betterley. 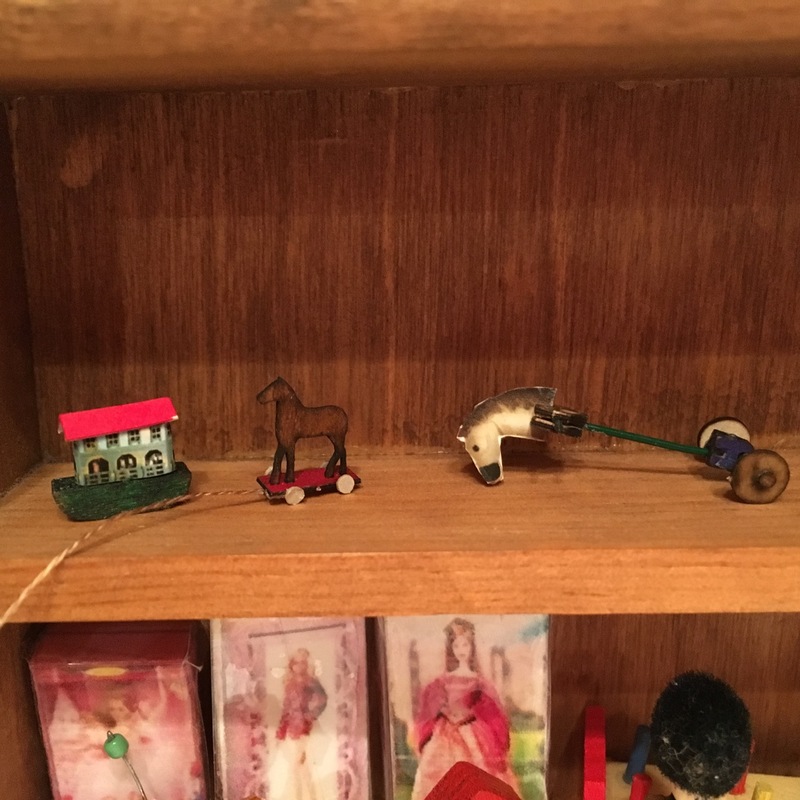 I didn't realize at the time that they were half scale, which makes them really, really small. 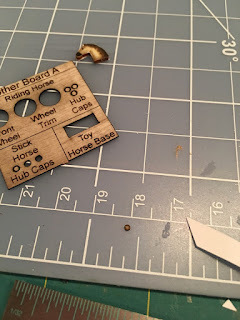 Cutting out the paper images is pretty tricky. You need small, paper cutting scissors that are very sharp. The pieces are so small. 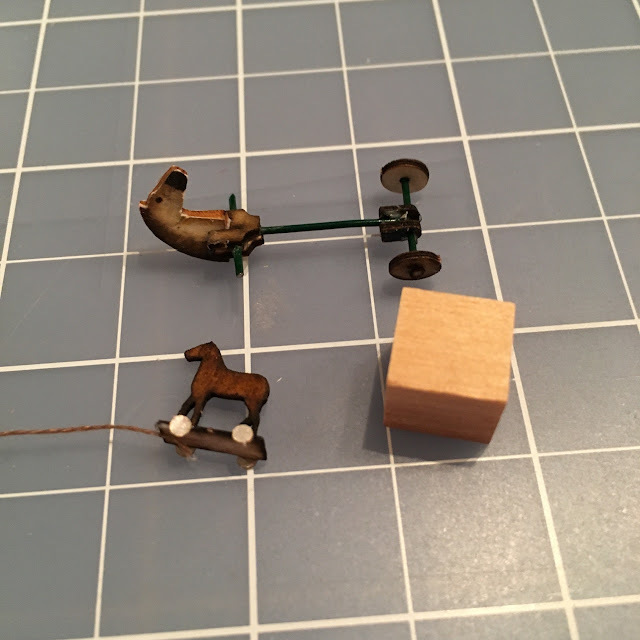 Pull toy finished. Love it. Used a sharpie pen to color the red. The kit comes with 4 toys to assemble and two game boards. 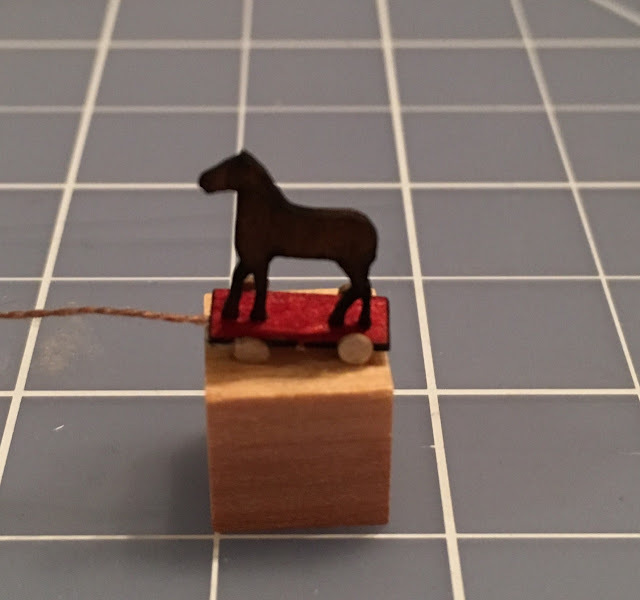 The stick horse is done, too. 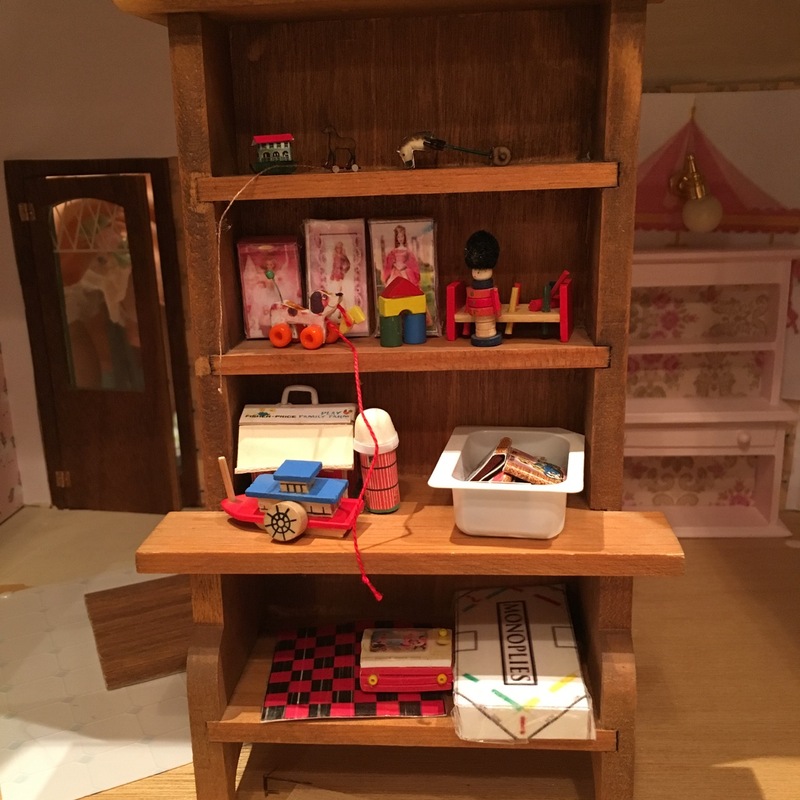 I wanted to find a safe place to store my toys until they go into the house, so I've been playing. 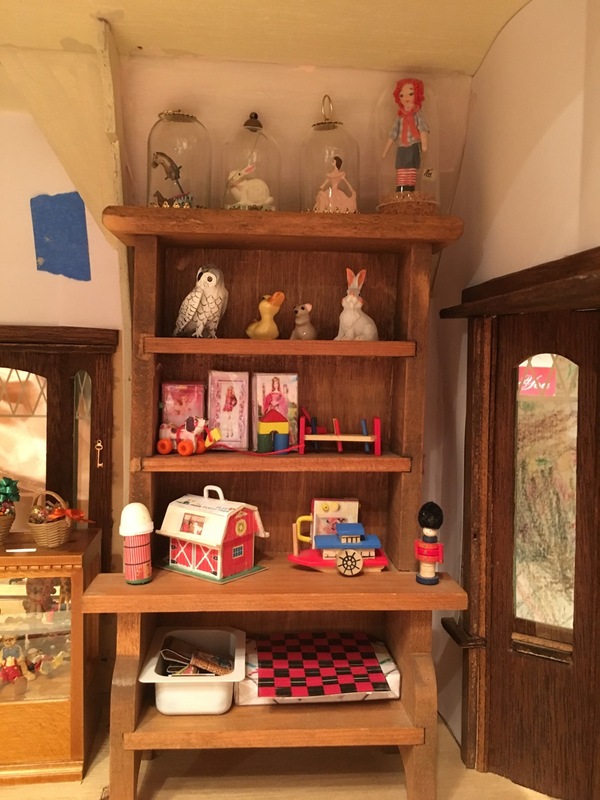 This shelf while it fits in the house is out of scale, is nice way display the toys and has inspired me to rethink some my original design thoughts. 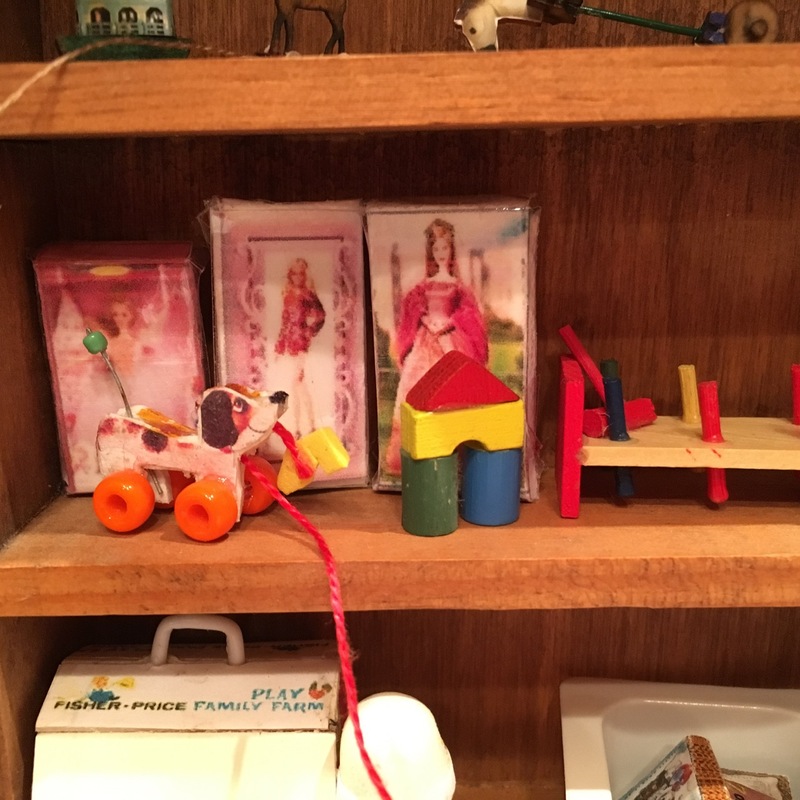 I even found some Barbie boxes to print and cut out. I need to redo them. Instead of gluing them together I used scotch tape to hold them together, making them look cellophane wrapped, but they are rough. I also need to change printer ink, too, to get a better image. 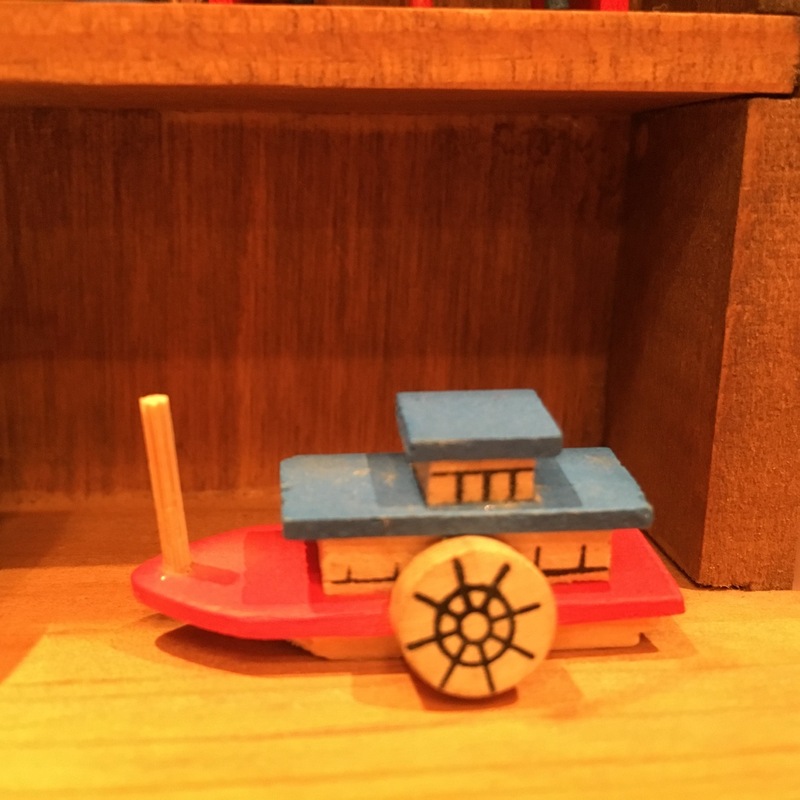 I found more timeless and classic toys on eBay: this boat, multicolored blocks, and beg bench came together from eBay. Shelf looks pretty cute, but I have another plan. I want to have the carousel mural on the wall, so I am going to remove the light and use glass shelves over it over the mural. I finally realized that I can do whatever I want and I don't have to be bound by the previous builder--it's just that electrical is so tricky and the current lighting works, so I hate changing the lights, but the one on this wall is certainly in the way. Looks pretty crowded, but then as I look at toy stores online, they carry a lot of inventory. 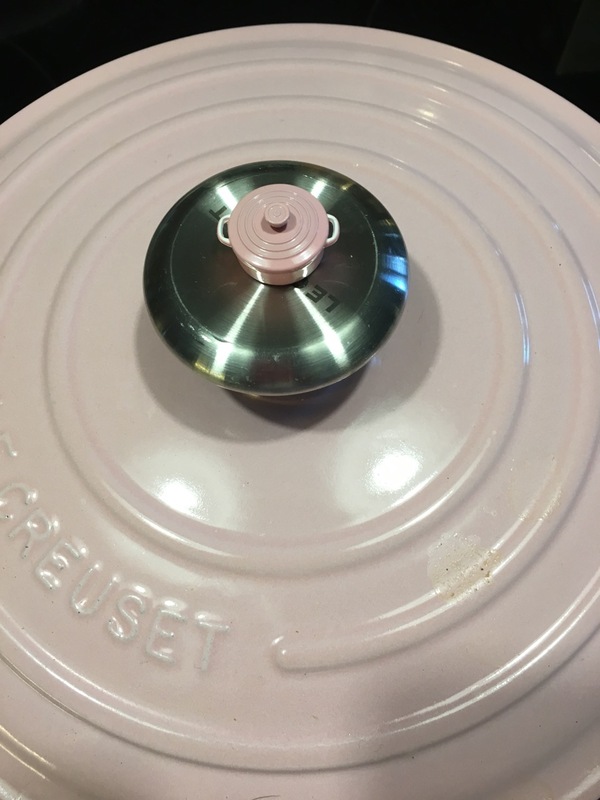 A while back I bit the bullet and purchased a Le Creuset dutch oven. I'd read that once you buy one you will never need another pan, and that is so close to the truth. I love to watch Ina Garten, The Barefoot Contessa, use her dutch over. 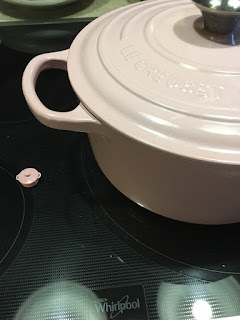 I was finally lured to purchase the expensive piece of cookware because the one on display was pink, a special commemorative piece produced for breast cancer awareness. 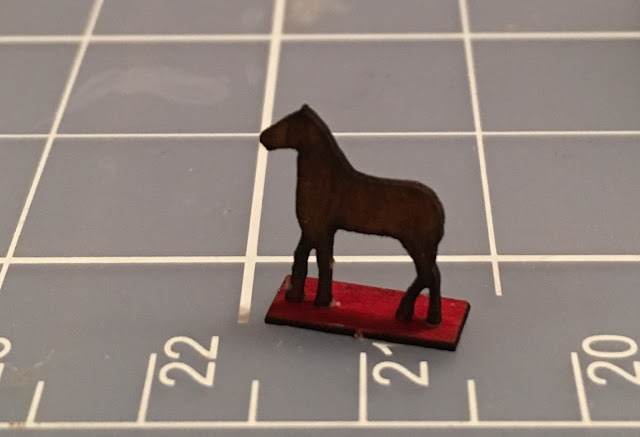 So in my searching for minis on Etsy when I ran across CLD Miniature in Australia and of course, I had to purchase this little mini dutch over. Right now it is in the Bellingham, a nice compliment to the green, I think. Here in Northern Colorado the weather is mild, with the temperature climbing in the 50s, while other parts of the country are freezing cold and buried under feet of snow, we are wishing for more moisture. Anxious for spring, I will be called to the garden, so I must live small while I can. Thanks so much for joining me today. Wow! You are doing an amazing job with the wallpaper retrofitting! Such patience! 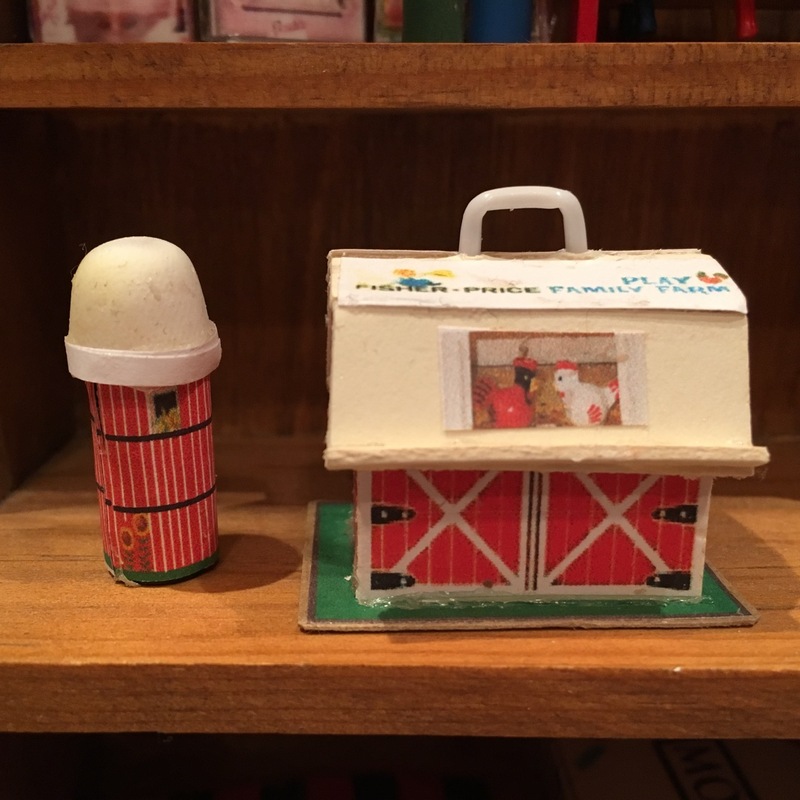 The Fischer Price toys are really adorable and bring back such memories! And the half scale toys look fun, but I imagine are really fiddly to work with! 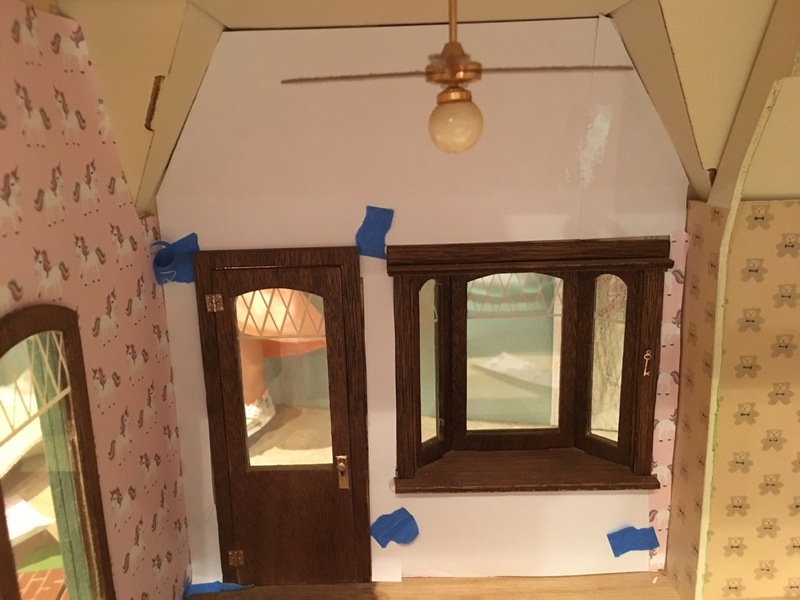 I made a 1/144th scale dollhouse kit once and it was incredibly difficult! Good luck with the carousel! I can't wait to see it! I am Loving the new wallpaper as it really brightens things up and is totally appropriate for this store. I live and garden with my husband in zone 5. We moved to the Garden Spot in February 2009, five acres with a pasture a big barn, and lots of space to garden. My husband is retired, but I still work at a small university in Northern Colorado. I teach freshman English and Introduction to Literature.